Research from the laboratory of Nima Sharifi, MD, Cancer Biology, was recognized as one of the Top Ten Clinical Research Achievements by the Clinical Research (CR) Forum, a national organization of senior researchers and thought leaders from the nation’s leading academic health centers. The CR Forum selected Dr. Sharifi's research published in the October 2016 edition of Lancet Oncology, which showed for the first time that patients with advanced prostate cancer are more likely to die earlier from their disease if they carry a specific testosterone-related genetic abnormality. 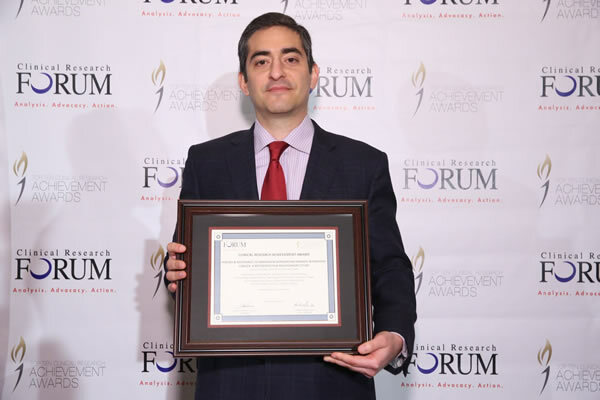 On April 18, the CR Forum hosted its sixth annual awards ceremony at the National Press Club in Washington, D.C., to recognize the Top Ten clinical research studies of the year. Winners were chosen based on the degree of innovation and novelty involved in the advancement of science; contribution to the understanding of human disease and/or physiology; and potential impact upon the diagnosis, prevention and/or treatment of disease. Dr. Sharifi’s research found that a specific, inherited polymorphism – or inherited genetic change – in the HSD3B1 gene renders standard therapy for metastatic prostate cancer less effective. Men involved in the study were treated with androgen deprivation therapy (ADT, also known as “medical castration”), the standard of care for treatment of metastatic prostate cancer. While the treatment is widely successful in many patients, eventually prostate tumors are able to circumvent ADT, and patients become resistant to the treatment because the tumors make their own androgens. Dr. Sharifi is also a staff member in the Glickman Urological & Kidney Institute and Taussig Cancer Institute. He holds the Kendrick Family Endowed Chair for Prostate Cancer Research.